Increased the maximum upload size in IIS to 1073741824 from IIS manager and restarted the IIS. Can you tell the solution for the above problem? 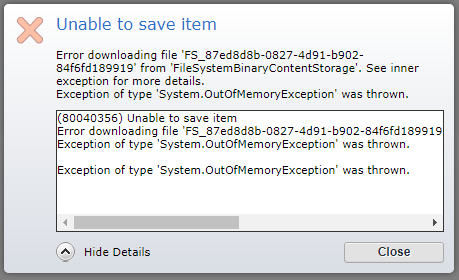 Error downloading file 'FS_e082b44d-f4e7-4265-b25f-3420199703d6' from 'FileSystemBinaryContentStorage'. See inner exception for more details. Exception of type 'System.OutOfMemoryException' was thrown. Can you go to the Event Viewer on the CM server and grab the entire stack trace for this error? 1)System.OutOfMemoryException seems would be due to lack of actual system memory, despite your config changes. Look up generic Windows reasons and remedies for this. 2) error states "error downloading file...from FileSystemBinaryContentStorage", this hints that it's during the process of when the server downloaded it from your browser, saved it to a temp file system location (to a temp folder) and then attempted to buffer it in RAM in prep for writing into the CM database and ran out of available RAM. On the latter, check your SQL Server/Oracle DB swap space/page memory config to ensure the DB temp memory is sufficient. But also look at what memory your Windows server has. 3) submit a ticket to SDL Support right away. They might already have the specific resolution documented in their knowledge base. Not the answer you're looking for? Browse other questions tagged cme web8.5 sdl-tridion multimedia binary or ask your own question.